Unlike the past, I recently accepted a few articles by guest authors. Bless them for helping us build a one-stop informational source regarding our hobby, the metal we love, and our investment vehicle. I've posted a couple articles translated by computer from their native language. I did this because I don't really have as much time as necessary to provide daily market insights in the form of articles on this site. I'll have more time in the future and I guarantee this site will continue to grow (we're getting more viewers now than ever before), however, I will be using the help of others as well to help us reach this goal. Recently I uploaded a few articles about rare palladium (rare to do this, but I added a few) and how all signs point to it rising in value. There are so many scientific applications palladium that once again, after the economy turns around, within the next 10 years, palladium will surpass gold. The use of palladium is just beginning to come into play in the scientific world. Hydrogen cells, solar power, automobiles, diesel engines, jewelry (it's overtaking platinum because it's cheaper, lighter, and a bit harder than platinum), and many other applications. In fact, palladium hardness is harder than gold, silver, and platinum. It has a 4.5 mohs rating where gold and silver are 2.5 and platinum is in the low 4s. Rhodium hardness, by the way, is 6, making it a good choice to coat white gold, silver, an other jewelry. 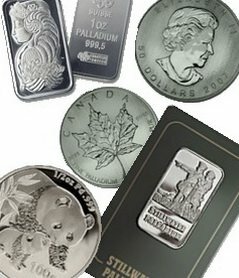 Palladium jewelry, such as a palladium necklace or palladium ring will be harder than a platinum ring or gold ring, but a very thing coating of rhodium would be a good idea (as a metal you won't see rhodium cheap, rhodium is usually more than gold and rhodium volatile, but in such a thin coat it costs next to nothing.